Ranky Tanky talks about the influence and tradition that Gullah has had on their music and band name in this NPR interview here. "...One of the greatest gifts of the year, an incredible piece of work overflowing with authenticity." Read the full review here. Spotlight Talk with Dennis Parnell starting at 6:45 PM. Learn more here. Ranky Tanky released their eponymous debut on Oct. 20th, 2017. By December of that year, the group had been profiled on NPR’s Fresh Air with Terry Gross and their album soared to the #1 position on the Billboard, I-Tunes and Amazon Jazz Charts. “Gullah” comes from West African language and means “a people blessed by God.” “Ranky Tanky” translates loosely as “Work It” or “Get Funky!” In this spirit this Charleston, S.C. based quintet performs timeless music of Gullah culture born in the southeastern Sea Island region of the United States. 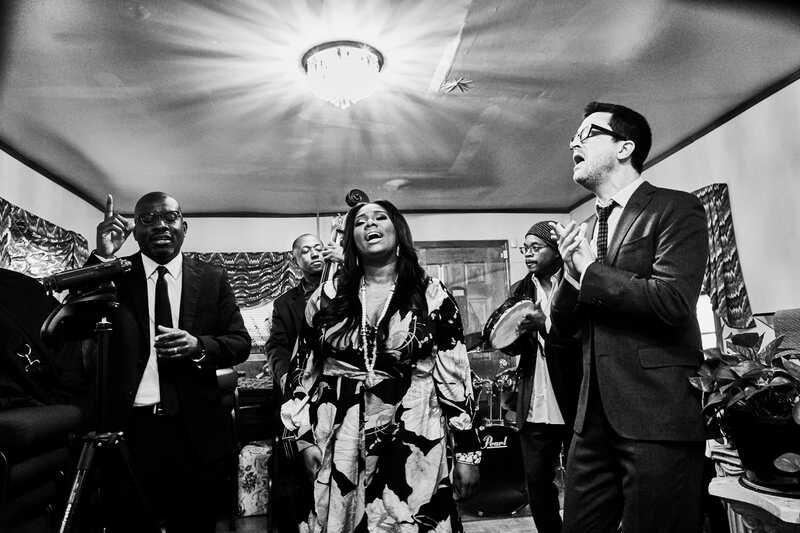 From playful game songs to ecstatic shouts, from heartbreaking spirituals to delicate lullabies, the musical roots of Charleston are “rank” and fertile ground from which these contemporary artists are grateful to have grown. South Carolina natives Quentin Baxter, Kevin Hamilton, Charlton Singleton and Clay Ross first came together in 1998 fresh out of University to form a seminal Charleston jazz quartet. Now, united by years apart and a deeper understanding of home, these accomplished artists have come together again, joined by one of the low-country’s most celebrated vocalists Quiana Parler, to revive a “Heartland of American Music” born in their own backyards. Kevin Hamilton (Bass) is a celebrated artist in Charleston’s vibrant jazz scene. He has performed internationally with diverse ensembles such as The Charleston Jazz Orchestra, Houston Person, Gregory Hines and Rene Marie. Kevin Hamilton joined the U.S. Dept. of State’s OneBeat program in 2012 and holds a degree in music theory and composition from the College of Charleston. Calvin Baxter (Drums) is playing tonight for his uncle Quentin E. Baxter, a GRAMMY®-nominated musician/producer currently on tour with Freddy Cole and Rene Marie. Calvin “is known as a gifted producer, engineer and multi-instrumentalist who is quickly garnering a reputation among musical cognoscenti as a go-to guy for R&B and Funk. His primary instrument is drums, but he is an accomplished keyboard player, singer and guitar player” - The Post and Courier of Charleston.